Modi in West Bengal LIVE updates: The prime minister, who addressed rallies in Durgapur and Thakurnagar, accused the TMC government of treading the path of the previous Communist government to trample democracy. 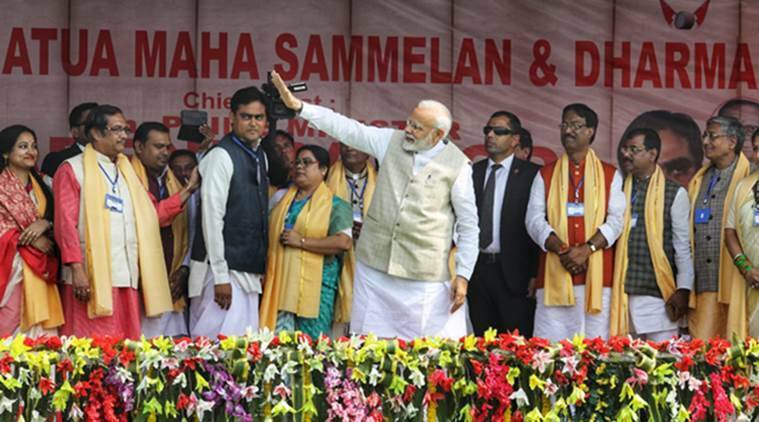 Modi in West Bengal LIVE updates: In preparation for the upcoming Lok Sabha elections in May, Prime Minister Narendra Modi on Saturday kickstarted BJP’s campaign in West Bengal by attacking the Mamata Banerjee-led Trinamool Congress government over a wide range of issues. Modi, who addressed rallies in Durgapur and Thakurnagar, accused the government of treading the path of the previous Communist government to trample democracy. 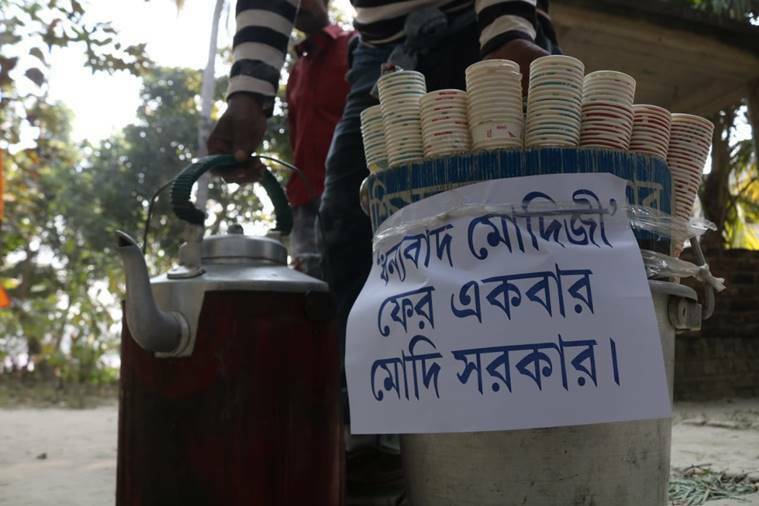 “TMC doesn’t take interest in initiating development projects where there is no share for the syndicate…where there is no ‘malai’ (cream),” he said in Durgapur. PM Modi addressed two rallies in West Bengal today. Get latest updates here. PM Modi concludes speech in Durgapur. "No one opposed this culture of syndicate and TTT, which is why the TMC had a free rein. But, now, the BJP will oppose this. The chowkidaar has started a cleanliness drive against this culture," PM Modi said. Accusing the ruling TMC of "playing with the future of Bengal", PM Modi hit out at the government over the scams in the state. "This reminds me of TTT- Trinamool Tolabaazi Tax," he said, adding that CM Banerjee cannot tolerate praise for him. "Mamata treading path of erstwhile Communists but she should know throttling democracy did not succeed then, will not succeed now," the PM told the crowd. "There was a lot of enthusiasm during my rally in Thakurnagar, and I think the ground was filled twice its capacity. I would like to apologise for the discomfort the people went through," PM Modi said. PM Modi said that the Central government is making efforts to develop infrastructure in the state and crores of rupees have been allocated for several railway projects in West Bengal. He further said that the TMC government isn't serious about the state's development. PM Modi while addressing the second rally in West Bengal in Durgapur says that "The public's love for Bengal, towards the BJP, has kept Didi out of sleep, he added. Modi further apologises to people, especially women for the difficulties faced by them and assures party's focus on the state. Modi speaks about the development and infrastructure of West Bengal and says that the state government is not serious about it. " The infrastructure, which is around 90,000 crore, is still not completed. And even if it has started, it is being done at snail's pace," said Modi. Prime Minister Narendra Modi is addressing a rally in Durgapur in West Bengal. Union Home Minister Rajnath Singh while addressing a public meeting at Falakata, Alipurduar, West Bengal says, all the schemes the Centre introduced in India and wished to bring in West Bengal were rejected by the TMC. Further, Singh assured people of the state to not resolve to violence in case CPM members of Congress party attacks them. "No matter how much CPM and Congress attacks you, do not take retaliate violently. But remember, people who have been violent to you or those who have been killed, our party will not leave them," says Singh. 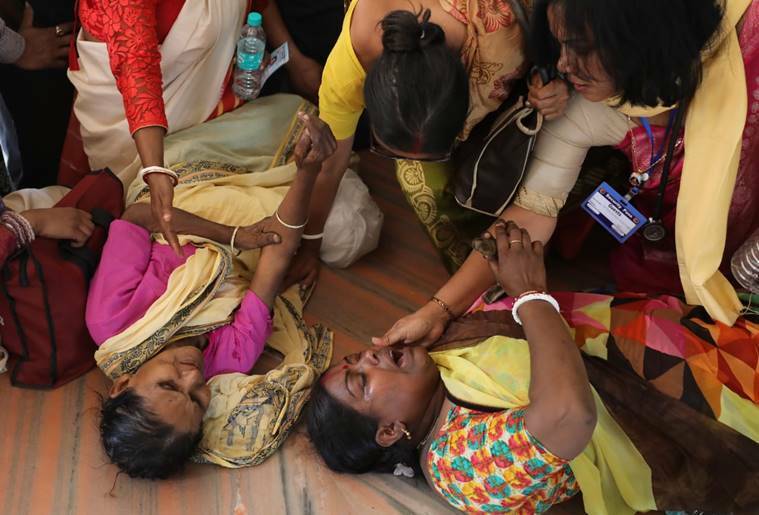 Modi cut-short his address within 14 minutes in Thakurnagar as a stampede-like situation arose at the venue, as reported by PTI. In order to control the situation, at the venue, Modi repeatedly was heard saying that the land where people were assembled was small and requested them to settle down. Ahead of PM Modi's rally in West Bengal today, BJP and TMC activists in Durgapur clashed on Friday allegedly on the removal of Modi's posters near the venue on. 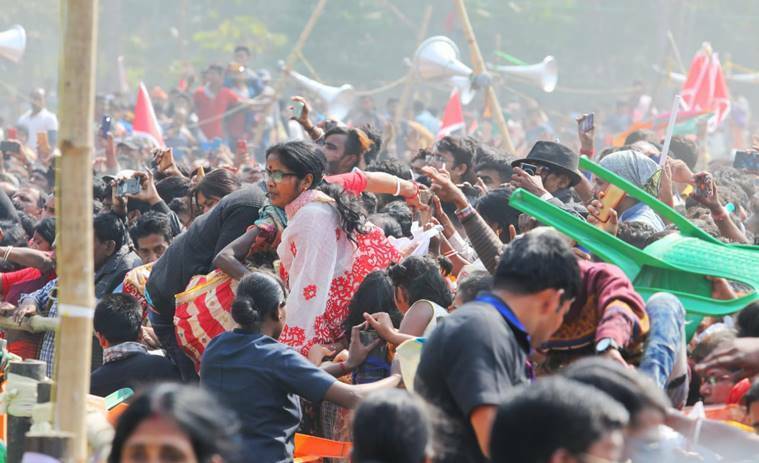 Few BJP activists were injured last night, the party's state general secretary Sayantan Basu said, as quoted by PTI. It was also alleged by the state party general secretary that Trinamool Congress (TMC) workers threatened BJP activists and tore posters and placards bearing the image of PM Modi. "They took out our posters and posted photos of TMC leaders. 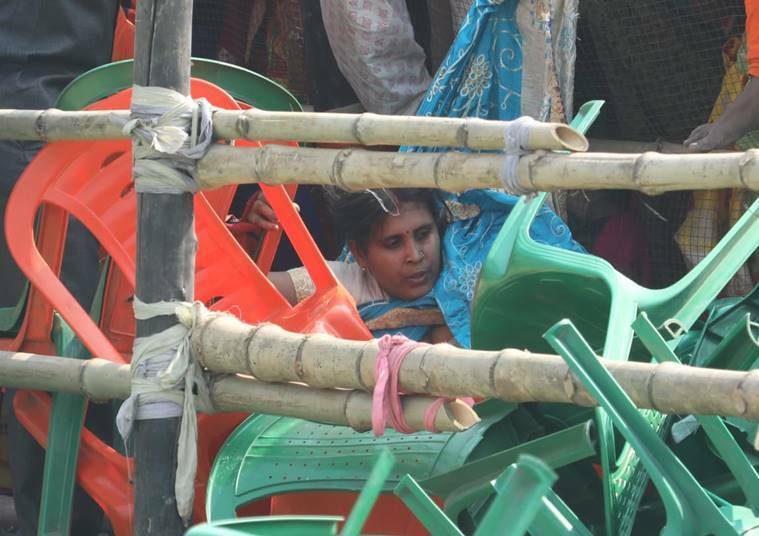 Our workers were also roughed up," Basu said. However, local TMC leadership denied allegations and claimed that BJP sprayed black paint on posters of Chief Minister Mamata Banerjee. Speaking on the Citizenship bill, Modi appeals TMC to support and help enforce the bill in the North Eastern region of the country. He reasons to help people stuck Pakistan and Bangladesh. Prime Minister Narendra Modi reiterates the scheme for farmers spelt out on Friday by Finance Minister Piyush Goyal during his budget speech relating to the direct transfer of Rs 6000 per year to farmers' accounts with five acres land. In the name of loan waiver, farmers of the country have been duped by all the political parties, said Modi at Thakurnagar while addressing a public rally. Modi began his speech stating that villages have been neglected for many, many years after Independence, especially West Bengal. "More than 12 crore families of small farmers, 30-40 crore workers and 3 crore middle-class families will directly benefit from the schemes announced in the budget yesterday," said Modi. "This is just the beginning, the main budget after the Lok Sabha election will have much more for the youth, farmers, and other sections of the society," says PM Modi in Thakurnagar. Union Home Minister Rajnath Singh is on his way to address public meetings at Falakata (Alipurduar) and Mathabhanga (Cooch Bihar). Singh, along with Uttar Pradesh Chief Minister Yogi Adityanath and many other top leaders will be attending several ‘Ganatantra Bachao’ rallies across the state. Heading to West Bengal today. Shall address public meetings at Falakata (Alipurduar) and Mathabhanga (Cooch Bihar). Looking forward to it. In an interview with The Indian Express, BJP's in charge of north-eastern states of Jammu and Kashmir Ram Madhav had claimed that BJP would be focusing more to West Bengal and Odisha now in the hope to get more seats in the states. "We probably have to put more attention. Now that we are paying greater attention to West Bengal and Odisha, we are hoping to get more seats there.," Madhav had said when asked what is curbing BJP's growth as an electoral force in the South other than in Karnataka. On Wednesday West Bengal Chief Minister Mamata Banerjee took pot shots at BJP national president Amit Shah alleging her of selling paintings to chit fund owners and asked him to prove his claims or resign from politics. Shah had earlier said that the West Bengal government copied central government schemes and that Durga and Saraswati pujas are not held here. Tuesday, Shah alleged that state government is not taking any action against chit fund companies as paintings of Mamata Banerjee was bought by owners of such companies. The BJP leader also alleged that Durga and Saraswati Pujas are not held in Bengal. Welcome to our live blog. 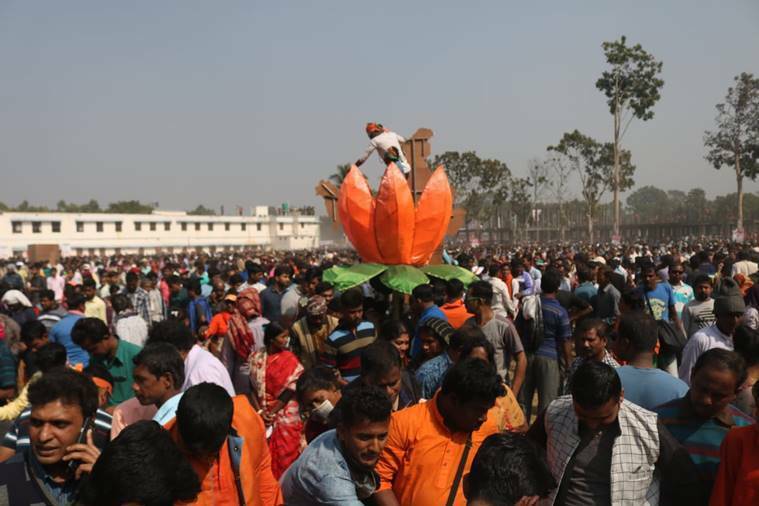 Get all the latest updates on BJP's West Bengal rally here. The rallies come at a time when the ruling Trinamool Congress in the state gave a call to oust BJP in the next General Election. 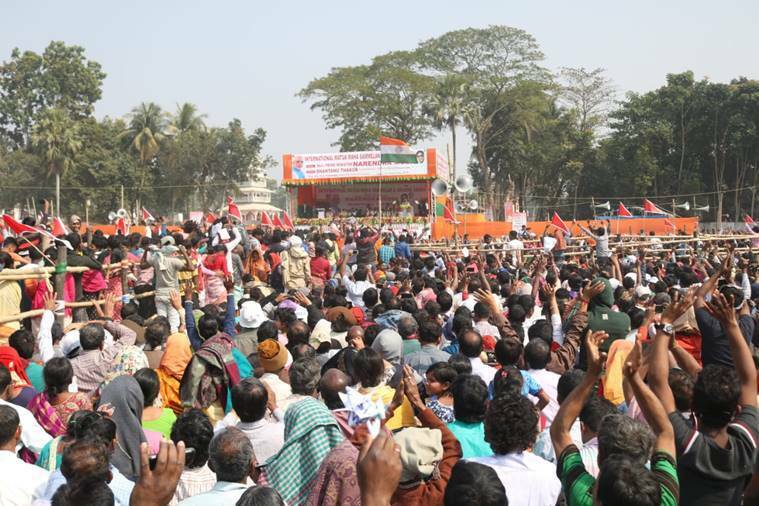 The TMC had on January 19 organised a mega opposition rally which was attended by leaders of 24 parties from across the country, including the Congress. 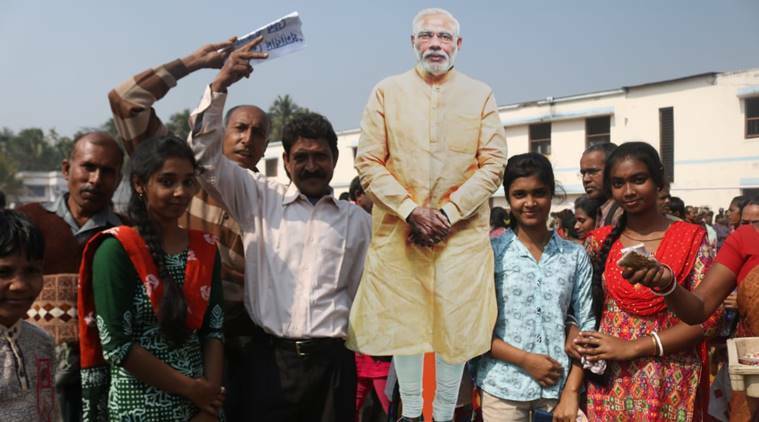 Modi is scheduled to address his third rally on February 8 at Siliguri in north Bengal, one of the areas where BJP had witnessed a surge in its vote share in the last panchayat polls. West Bengal BJP president Dilip Ghosh said apart from Modi, Union Home Minister Rajnath Singh, Uttar Pradesh Chief Minister Yogi Adityanath and many other top leaders will attend several ‘Ganatantra Bachao’ rallies across the state.